Ever wonder why leaves change color? I'll try keep it simple. Chlorophyll, which is what makes leave green, can only be made when the weather is warm enough and there's sufficient daylight. As it cools down, chlorophyll production stops. Warm days and cool nights encourage production of sugars and anthocyanins (red, purple, and blue colors). When a leaf gets ready to fall, sugars and pigments get trapped in the leaf blade, which is how fall colors result. What determines the brightness of a leaf? The more glucose the leaf has, the brighter the color. Thankfully, the Smoky Mountains is one of those fortunate places in the world where you can experience the beauty of autumn foliage. While it's hard to predict peak color exactly, you can find fall color as early as mid-September in the higher elevations. Fall colors can be seen at elevations over 4,000' starting in early October. 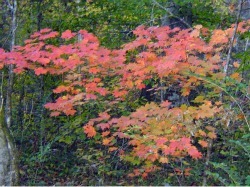 At the mid and lower elevations, autumn colors usually peak around mid-October to early November. 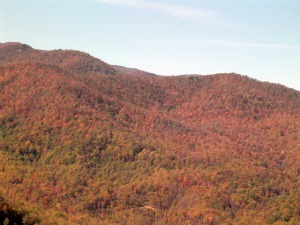 Since fall is such a beautiful time to visit the Smokies, it can also get quite busy. Keep that in mind when you're navigating busy spots like Cades Cove and Newfound Gap Rd. If you're visiting in mid-September through mid-October, go for the higher elevation hikes. Alum Cave to Mount LeConte, Gregory Bald, Mount Cammerer, Clingmans Dome, Hemphill Bald, and Sugarland Mountain are all great hikes to check out. If you're visiting in mid-October through early November, seek out the lower elevation hikes. Check out Rich Mountain Loop, Cucumber Gap Loop, Abrams Falls, and Schoolhouse Gap hiking trails. Wherever you decide to go in the Smokies during the fall season, remember to reflect on the beauty God has given us and thank Him for giving us richly all things to enjoy (1 Timothy 6:17). Copyright © 2011 Smoky-Mountains-Hiking-Guide.com. All Rights Reserved.